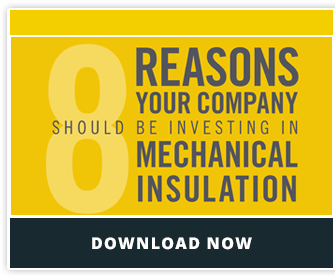 Mechanical insulation is a technology that many people don’t consider when planning their energy and cost-saving initiatives. They don’t understand how much of an impact insulating mechanical equipment can have on every aspect of their facility’s operations from process control to greenhouse gas emissions. But after reading the statistics below, I don’t insulation it is something you’ll overlook again. The heat loss in this example equates to 5,800 barrels of oil per day at $50/barrel. That’s $290,000 lost per day! In 2009, the U.S. Department of Energy’s Industrial Technologies Program conducted over 700 assessments of industrial facilities. These assessment references indicate that mechanical insulation provides an attractive simple return. That means that the full ROI for insulation systems is normally less than 3 years. Working with the Department of Energy and Oak Ridge National Laboratory, the NIA was able to extrapolate the data from those assessments for large and medium-sized industrial facilities. What counts as a large, medium, and small facility? See the table below. Here are the estimated energy savings, emission reduction, and jobs created with improved maintenance and focus on mechanical insulation for a portion of the industrial segment. Check out these Near-Term Insulation Initiative Examples provided by the NIA, based on real assessments and professional estimates. By replacing, repairing, and improving existing insulation on their steam system, Dow Chemical has a potential savings of $811,000 per year. By adding insulation to bare pipes and fittings, Frito-Lay has an estimated annual savings of $80,000. With an estimated project cost of $150,000, the simple payback is 1.88 years. By improving and replacing missing insulation on the steam and condensate lines, Bayer’s 2 steam plants has a potential savings of $926,000 per year. It’s easy to look at these numbers and think they’re crazy, but these are real potential savings! Want results like these? You can have a Certified Insulation Energy Appraiser audit your facility and make recommendations. With such an obvious ROI, why wouldn’t you invest in insulation?